In one of my PIC lab, I asked the students tried to circulate the lights (of two lines) on 7 segment LED. That is, A-B, B-C, …. F-G, G-A, and A-B again. However, I found it looked ugly and I asked them to make the circulation without going through the segment G.
Rotation of lights from AB to BC, …., EF and FA (without go through G). 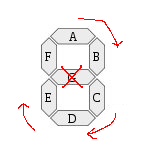 // Somewhere after "rlnc PORTD" -- the rotation of 7 segments lines. That is, if it was the lines of G-A, then change it to A-B. Many of them (OK … excluding the Robot students..) struck very hard to get this done. If you have SDCC or any PIC C compiler, you can just type your C code and change it to assembly. These are what I got from my SDCC. Surprisingly it was just a simple XOR operation of 5 lines codes. p/s: PiKLab and SDCC are a good combination for C programming in Linux ^^. It is just about 5 line of code as usual. Next Next post: Why Softcopy?